Camborne Regeneration Forum, with support through Community Chest funding from Cornwall Councillors Jeff Collins and Dave Biggs, has instituted a new annual award. It is called the ’Fairtrade Camborne Youth Award’. 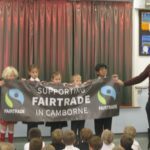 It will be presented annually to the school or youth group that has done the most to support Fairtrade in Camborne. 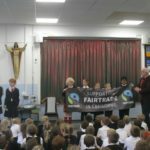 St John’s Catholic Primary School is the first recipient of the Fairtrade Youth Award 2018 for our work to support Fairtrade. Mr Brian Terry from Camborne Regeneration Forum presented the Fairtrade steering group with a cup for the year and a trophy to keep, with a cheque for £125.00. This year, the school have already raised £360 for Fairtrade!